@ashbub714 they are unfortunately very frequently used for sleep however they are not safe. Positional asphyxiation (what can happen when babies sleep on an incline) can happen swiftly and silently, even with you watching them. A deeply asleep infant and one who’s stopped breathing don’t look all that different until they turn blue. If baby falls asleep on any inclined surface, they should be moved to a flat place as soon as possible. That's so interesting about swaddling with blankets not being recommended. My DS HATED being swaddled, screamed bloody murder trying to get his arms out, so I always forget that swaddling is a thing. I gave the couple of velcro swaddlers I had gotten to one of my friends. So, if new baby takes to swaddling, we'll either have to go the old fashioned route or have Amazon Prime on standby for some new ones. We have LOVED our 4moms Breeze. Definitely more expensive then other pack n plays and it’s a tad heavy but to set it up is nothing, literally takes seconds which was invaluable after driving a couple hours to grandparents houses and not having to spend any extra time setting up and wrestling with it and of course it’s definitely worth justifying the price now that we’ll get to use it with baby #2. Honorable mention definitely the Aden and Anais sleep sacks after growing out of swaddling. They are seriously the softest and so comfy. We have them in all the sizes and use their crib sheets as well! Second on swaddling not being for everyone. In the beginning we swaddled DD with arms out using the muslin blankets. Then we quickly moved on to the Halo Sleep Sacks which are the best imo. Different things work for different babies. DD would bust her arms out of swaddles right away but slept well when swaddled with arms out. We didn't like the idea of forcing her arms down with a velcro swaddler if that's not what she preferred. We used the halo sleep sacks till she was like 18 months old. I love this thread! I used sleep sacks mainly for warmth than for swaddling. Sound machine yes! I had forgotten so helpful. @lindsayleigh1989 I was so paranoid about that! I think I only let DD sleep in the rock n play for about a month and then I moved her to the pack n play to get her ready for the crib. So much this. I've worked with a couple kiddos who just didn't transition well at all. I mean, if it works for you that's awesome, but for me personally RnP is not part of the baby gear. +1 to soundmaker, btw, especially white noise. Oh yes I loooove our white noise machine. I have a second one in my Amazon cart for baby girl since my boys still use theirs. We have the Marpac Dohm. It only does white noise (no ocean sounds or anything) but my kids sleep through anything as long as it's on in their room. And I mean anything. I've set the fire alarm off and they don't wake up (and that is with a strobe light and an audible alarm IN their room that's wired to the rest of the house so they alllll go off at once). 1 - For those that waxed ahead of delivery. How close to your due date did you get your last wax? I definitely can't take care of things well down there, but I also don't want to cut it so close that I get waxed and then go into labor while things are still tender from being waxed. 2 - Has anyone use the Mamma Strut postpartum support system? It seems pretty handy and I can get my insurance to cover it so I'm thinking about getting it. Question on swaddling or sleep sacks - I've heard you aren't supposed to swaddle once babies can roll over. Does that include sleep sacks like halo? Or if arms are free is it fine? @mrsmiller8588 I went to a baby basics class and the nurse promoted the sleep sacks (zipper opens at the bottom). The nurse said not to use blankets of any kind or to swaddle baby for sleep. Something to do with suffocating and SIDS as well...I have the book that explains it more. Let me find it and I'll post the reasoning. Every nurse and ob has recommended the sleep sacks up until 6 months for sleeping. @MrsMiller8588 Yes, swaddling should stop once they can roll over and yes, that just refers to having hands available. Reasoning is, if they roll onto their belly, they need to have their hands and arms free to roll back to their back. Sleep sacks don't prevent rolling, or even standing for older kids. DD is almost 1 and still sleeps in a sleep sack most nights. @TalesOfASocialIntrovert Thank you! That's what I was thinking but I did ask my LC/nurse specifically about sleep sacks once they could roll and was told no to those too but didn't know why. Thanks for the responses RE: Rock n Plays ladies! Thats super helpful! @owl_momma oh my goodness that does sound scary! I would have panicked! Edited to finish my sentence above. My son was in a sleep sack until like 18 months for warmth... He could move, stand and walk in it but never woke up twisted or anything so I felt confident using it. Sleep sacks were great for warmth after swaddling. I kept DS in as long as possible, like 18 mo. I think they also keep them from climbing out of the crib- as soon as DS stopped using them he figured out how to Houdini his way out and we had to switch to a toddler bed. My son is 20 months and still uses a halo sleep sack every night. He’s still got plenty of Room in the XL and it’s a way to keep him warm at night without having to worry about him kicking off the blanket, so he’ll be wearing his until it gets too small or he starts protesting it. As of right now he likes it and sleeps great in it. +1 on the sleep suit! It was truly magical! DS was an escape artist with any type of swaddle. +1 to the gas drops and gripe water being lifesavers! My son was sooo gassy and gas drops got us through so many times when we just couldn't figure out relief any other way! Gerber Soothe drops for colic/reflux. @MrsMiller8588 I had to add "for sleep"...they encourage swaddling until baby can roll over. They do not encourage swaddling for sleep. What are the must haves for baby first aid? I want to have a first aid bag/box handy for our home, my mom's, and my friend's house (she is pseudo-grandma). Infant fever/pain reducer. I like to have Motrin and Tylenol- I don’t remember, but I think one of them isn’t approved before 6mo? Those are the top 5 I’d say are must haves for a newborn, everything else you could buy as you need it like gas drops, gripe water, homeopathic cold medicines. I got this “new parent survival” (by little remedies) package at my shower with DS that had a ton of new baby useful medicines, but I don’t think they make it anymore. @TalesOfASocialIntrovert beat me too it - and make sure you pick up a dosing guide or as your pediatrician each time you go what the recommended Tylenol dosing is - the bottle basically says "do not use" or "call a dr" if less than 6 months. Same with benedryl - they don't post the dosing on the bottle, so if your ped has a chart, grab one for the medicine cabinet! 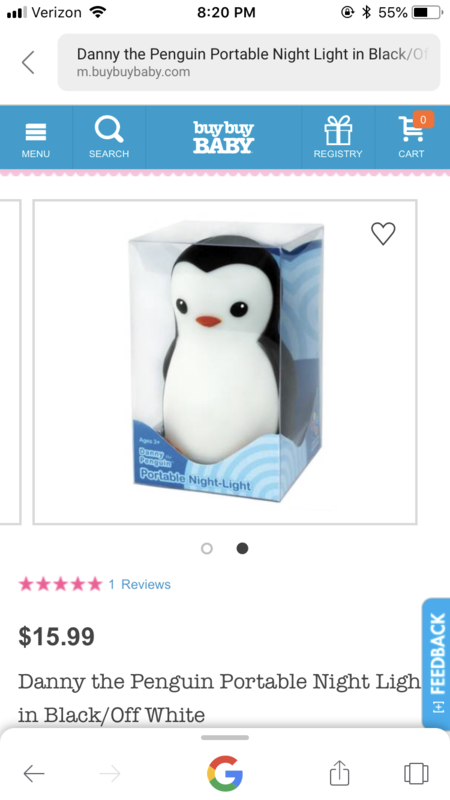 @julianne0 I am actually going to get a night light but I'm thinking of a clip on I saw on amazon however this one you posted looks so adorable!!! @kissableviv I loved swaddles so we did always swaddled for naps and bedtime. It helped ds1 associate sleep with the swaddle too. Question: I have diapers from last time I gave birth, will be sometime around 18 months ago when this LO is born. THey are all unopened, size ones, and from Honest Company. I didn't return because, you know, life and I don't even know if HC does that. ANYWAY, I can still use them right? @SmashJam don’t see why not! I have some in other sizes that i saved up from DS. Never heard you shouldn’t. Once DS was old enough to roll over, we LOVED our Halo Muslin Sleep Sack because it has the option to swaddle the baby with their arms out. It made the transition from the rock & play to the wide open crib SO MUCH EASIER. @MrsMiller8588 DD is 18 months and still uses sleep sacks. She can even walk in them (although I do not recommend that). If you search wearable blankets you will find lots of different brands that work just as well as the Halo Sleep Sack brand (I have several different kinds). I like the ones from Hudson Baby and Touched by Nature. On www.babymallonline.com you can find some as cheap as $8, and they are also reasonably priced on Amazon. Wearable blankets are recommended for safe sleep. Maybe the instructor was referring to swaddle sacks as being unsafe once babies can roll? Any wearable blanket that restricts the baby's arms would follow the same rules as swaddling. Swaddling is one of those topics that you will find conflicting information on. They did it at the hospital where we delivered, and they taught it to us in our Baby Basics class at the hospital. However, DD had to go to a children's hospital at 4 days old, and they would only use sleep sacks there. We swaddled for a few weeks (maybe 8?) because that is the only way DD would sleep at first. We stopped because she was lifting her head and starting to roll to her side. @zombiehoohaa +1 to Tylenol/acetaminophen and the rectal thermometer. We did not have a rectal thermometer with our first, and our LO got sick when she was only a couple months old (don't remember the exact age.) When we called the pediatrician's office, they would not accept a temperature from a forehead thermometer because they say it is not as accurate. DH had to go to the store in the middle of the night to buy a rectal thermometer and plastic covers. Get one now to avoid that! I would recommend dye-free medicine. Babies tend to spit out some when you are administering it. The laundry is a lot easier when you do not have bright red stains from medicine! I like the dye-free acetaminophen from Target. They make a grape flavor which DD will take easily. She hates cherry flavored medicine. I do too, so that is no surprise! I also recommend a drying rack and bottle brush for washing bottles and breast pump parts. I like the Boon drying rack. They have different sizes. You can get the grass size for $12.99 from Target. The lawn size is more expensive, but bigger. I like the munchkin bottle brushes. They are around $3 or $4 each depending on where you buy them and if you get a multi-pack. 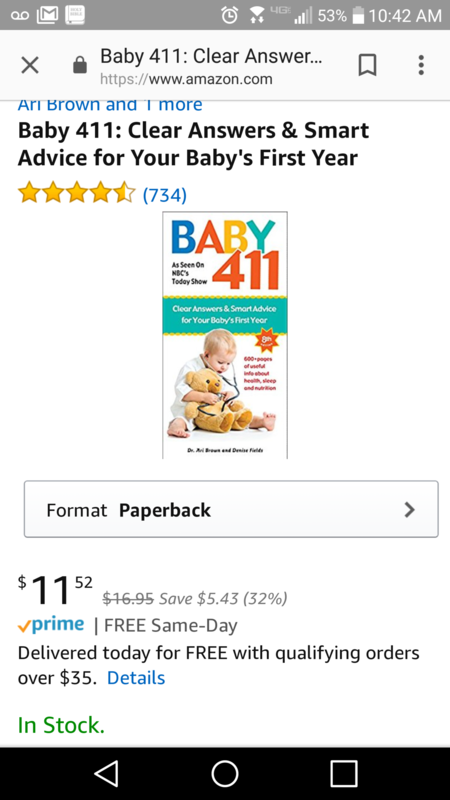 Also, Baby 411 is an excellent book! It is a great resource for random questions. It was co-authored by a pediatrician. It is not really a book you read through, but it is more of a reference guide. I love it because there is so much conflicting information online. This book has clear, simple answers from a reliable source.